GENEVA (AP) Russia has regained its place on the FIFA Council, six months after Deputy Prime Minister Vitaly Mutko was blocked from re-election. UEFA member federations on Wednesday elected Alexei Sorokin, CEO of the 2018 World Cup organizing committee, by acclamation as one of their delegates to FIFA’s strategy-setting committee. The seat, which runs through 2021, was vacant since May when Mutko was formally forced to step down. Mutko’s candidacy was blocked by FIFA’s then governance committee chairman, Miguel Maduro, because of a conflict of interest with his government work. Maduro, who was ousted by FIFA weeks later, said last week that the world soccer body’s leaders put pressure on him to protect Mutko’s position. Meeting with British lawmakers, Maduro said he was told that his ruling on Mutko’s eligibility could threaten FIFA President Gianni Infantino’s hold on power and ”would be a disaster” for the World Cup. FIFA is also investigating allegations from a World Anti-Doping Agency report into a Russian doping conspiracy at the 2014 Sochi Olympics that implicated Mutko in covering up potential doping violations, including in soccer. Evidence provided by WADA investigator Richard McLaren included a document that appeared to be linked to Russia’s 2014 World Cup squad. Last week, Maduro told British lawmakers that Infantino believes there is ”no evidence” Mutko is involved in the scandal. ”I have certainly heard that WADA has dropped many cases (arising from the McLaren report). I hope that justice will prevail and more cases will be dropped,” he added. 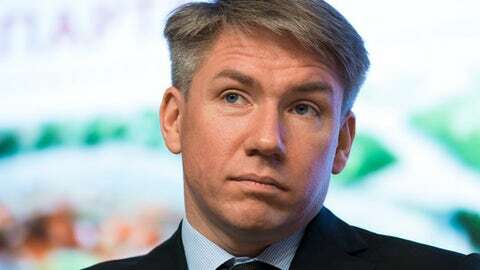 Sorokin became the eighth of the nine European delegates on the 37-member FIFA Council. The ninth was left vacant in July when long-time Spanish soccer leader Angel Maria Villar resigned as a vice president of FIFA and UEFA after being arrested in a corruption investigation. Villar was detained along with three other soccer officials, including his son, on charges of improper management, misappropriation of funds, corruption and falsifying documents. Interim replacements for Villar were announced Wednesday after a meeting of the UEFA executive committee. Portugal soccer federation president Fernando Gomes will join the FIFA Council until a full election of UEFA members on Feb. 26, and Italian federation CEO Michele Uva was named a UEFA vice president.